What Are The Best Online Master's in History Programs? What Else Can I Expect from an Online Master's in History Program? A master's degree in history online offers students the possibility of higher salary earnings and career advancement. Historians with an advanced degree earn an average of $59,100 annually, and they can bring home more than $107,000 a year. Take a look at the best online master's in history programs along with the typical degree path of an online history graduate student. Pursuing an online master's in history enables you to advance your career while strengthening your skills in writing, research, and historiography. You'll gain knowledge of periods in history and acquire specialized skills in archival management and document preservation. Graduates of online master's in history programs typically earn more than those with a bachelor's degree alone and often find employment in schools, museums, and other settings. No prior work experience is required to begin your online master's in history. Eligibility requirements for most programs include a bachelor's degree with a minimum GPA of 2.5-3.0 and GRE scores. Some programs only accept undergraduate work from regionally or nationally accredited institutions. Other common admissions requirements include a statement of purpose, a resume, and three letters of recommendation. CAN I WORK WHILE I COMPLETE MY ONLINE MASTER'S IN HISTORY? The flexible online format caters to working professionals. While some programs require students to attend full time, others allow part-time enrollment. A typical full-time load consists of two courses per semester. Though you can expect coursework to consume much of your time, it is possible to work full time and pursue a degree full time. In distance learning programs, students typically complete coursework when it is convenient for them. Some programs require students to be online at specified times, but this usually occurs during evenings to accommodate work schedules. WHAT ARE THE ADVANTAGES TO EARNING MY HISTORY DEGREE ONLINE? Online degrees offer students direct access to course materials and flexible deadlines. Online courses also provide opportunities for professional networking. Additionally, most online course delivery systems are compatible with mobile devices or tablets, and online students receive access to campus resources, including technology support and online research materials. Prestigious Harvard University offers distance learners the option to pursue degrees through the fully accredited Harvard Extension School. The school, one of 12 degree-granting colleges at Harvard, serves students in part-time, online, and non-residential undergraduate and graduate programs. Graduates participate in the university’s graduation ceremony and earn membership in the Harvard Alumni Association. For students interested in earning an online master’s in history from Harvard, the Extension School offers minimal on-campus commitment. Of the program’s 12 required courses, students must take only three on campus. Prior to applying for admission, prospective students must complete three preliminary courses to measure their ability to succeed. Students apply to the program during the third course, with three application cycles available each year. During the program, students take courses online and on campus, eventually choosing between a thesis or capstone project. Courses in the program include five history core classes, two electives, and a history seminar. Harvard Extension School offers special grants and scholarships to help students fund their online master’s in history. Residents of Massachusetts can also apply for state-funded grants towards their degree. Harvard holds regional accreditation from the New England Association of Schools and Colleges. The University of Nebraska at Kearney began as a teacher preparatory school in the early 1900s. In 1989 it was incorporated into the University of Nebraska system and renamed the University of Nebraska at Kearney. Since then, the university has grown to serve almost 7,000 undergraduate and graduate students, both on campus and online through distance learning programs. In addition to 120 undergraduate majors, UNK offers 27 graduate programs, including an online master’s in history. The history master’s program online at UNK requires 21-36 credit hours, depending on the concentration option chosen. The thesis and non-thesis master of arts in history tracks each require 36 credits, while the public history option requires only 21. The thesis option includes six thesis hours, while the non-thesis option substitutes six elective hours for the thesis. Core courses in the curriculum include historical methods, public and digital history, and courses in both U.S. and non-U.S. history. In the public history track, students also take a variety of seminar reading courses in American history, including readings in museums and historic sites, national parks, and historical memory. For admission, applicants must have completed at least 18 hours of undergraduate study in history and hold a bachelor’s degree with a minimum GPA of 3.25. Applicants must also submit GRE scores and a letter of intent. UNK holds regional accreditation from the Higher Learning Commission. The University of North Carolina Wilmington originally opened in 1947 as Wilmington College, and served just under 300 students. Granted community college status in 1957 and welcomed into the University of North Carolina System in 1968, the university has grown significantly since its opening. Today, UNCW serves a student body of over 16,000, including more than 2,000 graduate students. UNCW offers 55 bachelor’s, 35 master’s, and four doctoral programs. Learners interested in earning a graduate degree in history can earn an online history master’s degree at UNCW. Geared towards educators, the online degree option requires no thesis, and intends to provide current or future history teachers with information and skills to incorporate local, national, and global history into their classrooms. Students take two courses each semester, each lasting eight weeks, working towards the program’s 30 required credits. Short on-campus summer institutes provide students with intensive courses and a required comprehensive examination. Of the required 30 credits, students complete 24 completely online. As the program gears towards educators, students complete a lesson-planning project and teach a sample lesson to peers and faculty. Applicants must submit GRE scores for admission. Prospective students must possess a bachelor’s degree with a minimum B average in all undergraduate history courses. Applicants also submit a 500-word entrance essay outlining their academic goals and their interest in studying history at the graduate level. The University of North Carolina Wilmington holds regional accreditation from the Southern Association of Colleges and Schools. Founded in 1971 by Reverend Jerry Falwell, Liberty University in Lynchburg, Virginia is a fully accredited liberal arts evangelical institution that serves a student body of over 100,000. Of their more than 550 academic programs, Liberty offers over 250 entirely online. Liberty began its distance education program in the 1980s, sending VHS tape recordings of lectures to learners. Today Liberty offers courses online on Blackboard, and distance learners can access a variety of valuable digital resources. Distance and online learners interested in a graduate degree in history can earn an online master’s in history at Liberty in around 18 months. The 36-credit hour program takes place entirely online, with courses offered in 8-week sessions, with many students graduating after about four semesters of full-time study. The program’s core curriculum includes a seminar in American Christian heritage,and historical methods and interpretation. The program’s curriculum also emphasizes the Protestant Reformation and European Christian heritage in its European studies section. Applicants must hold a bachelor’s degree with a minimum undergraduate GPA of 3.0. Liberty accepts unofficial transcripts pending admission, at which point students must submit official transcripts. Applicants must also submit a 500-word statement of purpose. Certain students may receive a waiver for the application fee. Liberty holds regional accreditation from the Southern Association of Colleges and Schools. In 1819, Norwich University became the first private military college in the nation. Today, Norwich aims to serve students with varying lifestyles, needs, and academic goals. With such notable alumni as General Gordon R. Sullivan, former Chief of Staff of the U.S. Army, Norwich provides students with hands-on and relevant learning opportunities both on the Northfield, Vermont campus, and online. Norwich began experimenting with low-residency distance learning programs in 1981, offering its first online graduate programs in 1997. With many classes kept to a maximum of 15 students, Norwich’s online programs foster a strong sense of community and one-on-one interaction. Norwich offers an online history master’s degree consisting of six courses, totaling 36 credit hours. Students complete coursework in 11-week sessions, plus one week-long on-campus residency. Students typically complete the program in about 18 months. Learners select a concentration in American or world history, and have the option to pursue a thesis or non-thesis track. The non-thesis track includes a capstone course. The required residency at Norwich’s Vermont campus lasts a week, during which Norwich covers all costs of accommodation and food on campus for students. Applicants do not need to provide GRE or GMAT scores for admission. Instead, applicants submit transcripts showing an undergraduate GPA of at least 2.75, a letter of intent, and a letter of professional recommendation. Norwich holds regional accreditation from the New England Association of Schools and Colleges. A member of the Texas State University System, Sam Houston State University serves over 21,000 students, making it the twelfth largest university in the state. In addition to its on-campus programs, SHSU offers a variety of online options, including 25 graduate programs. Learners interested in earning a master of arts in history online can earn their degree at SHSU. The history program includes a minimum of 30 credit hours that students can complete entirely online. Students can also pursue a hybrid degree, which blends online and on-campus history seminars. Coursework in the program includes classes in American and European history, Japanese colonial empires, holocaust and genocide, and contemporary American studies. The program culminates in a thesis or written portfolio; students can pursue a non-thesis track with department approval. Students may complete coursework through both synchronous and asynchronous delivery, depending on instructor requirements. 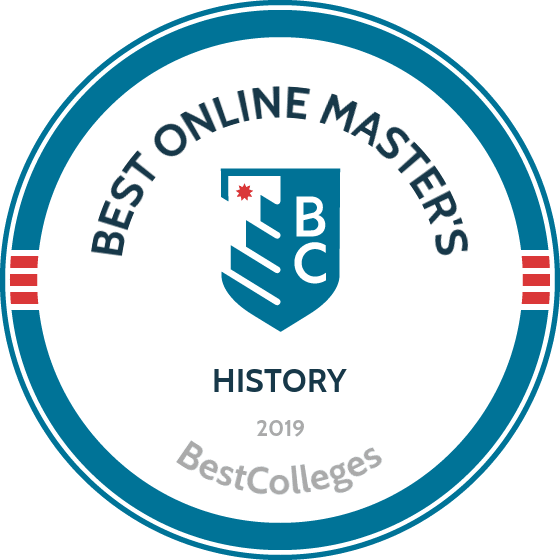 Applicants to the online master’s in history program at SHSU must have completed a minimum of 18 undergraduate credit hours in history or closely related fields. Students must submit GRE scores and official transcripts from all colleges attended, as well as two letters of recommendation and a statement of intent. SHSU holds regional accreditation from the Southern Association of Colleges and Schools. Established in 1964, the University of Massachusetts Boston became the second university in the UMass system. After merging with Boston State College, UMass Boston began offering a wider variety of graduate degrees in addition to its undergraduate programs. Today UMass Boston serves a student body of more than 16,000 undergraduate and graduate students within 10 distinct colleges, offering 207 unique degree and certificate programs. In addition to the degrees offered on UMass Boston’s sprawling downtown campus, students can pursue hybrid and fully online degrees through extensive distance learning offerings. UMass Boston offers an option for students seeking the best online history master’s programs. Students complete the required 30 credit hours entirely online, with no residency requirements. In an effort to keep the program and classes small, each year only 15-20 students enter the program, allowing for more one-on-one attention from faculty. The curriculum emphasizes research and research methodology. Some recent elective courses include Cold War America, Native American history, and World War I. Applicants must submit GRE scores, a statement of purpose, letters of recommendation, and a sample of formal academic writing. Students applying from within New England may benefit from a considerable tuition discount. UMass Boston holds regional accreditation from the New England Association of Schools and Colleges. Founded in 1889 as a teacher training institution, Slippery Rock University officially earned university status in 1983. Located in western Pennsylvania, SRU now serves a student body of over 8,500 undergraduate and graduate students at on campus, as well as online through distance learning. The online offerings at SRU include completion programs for undergraduate degrees, as well as master’s and doctoral degrees. The 16 unique master’s programs offered online at SRU include a master of arts in history. This program requires 30 credit hours, which students complete entirely online with no required campus visits. The curriculum emphasizes research and commonly used research methods in history, and includes courses in historiography, modern European history, women’s history, and U.S. foreign policy. After completing 21 credits, students must take and pass comprehensive examinations emphasizing the history of three different geographic regions. All faculty members in the program hold doctoral degrees in history, providing students with the most advanced scholars in the field. Graduates of the program can find work in a variety of fields or pursue doctoral degrees in history. Prospective students must submit transcripts showing a minimum GPA of 3.0, along with a one-page essay describing how the applicant feels the past has influenced the present. Applicants must also submit a $25 application fee. SRU holds regional accreditation from the Middle States Commission on Higher Education. Located in northern Louisiana in the city of Ruston, Louisiana Tech University serves as a four-year public research university, offering bachelor’s, master’s, and doctoral programs. Since its founding in 1894, Louisiana Tech has grown significantly to now serve a student body of over 12,000, including 1,500 graduate students. Louisiana Tech also serves students at Barksdale Air Force Base, offering veterans and active military personnel the opportunity to earn or complete their degree. Students interested in graduate study can earn their online history master’s degree at Louisiana Tech. The 30-credit hour program allows students to choose a thesis or non-thesis track, with the thesis track best serving students who plan to eventually go on to pursue a doctoral degree. This thesis track requires a research and thesis course that serves as three required thesis hours. Students who wish to pursue the non-thesis track complete an additional three credit hours of coursework in place of the research course. All students in both tracks take two required core courses in historiography and historical research and writing. During the program, students work with a faculty adviser to select an area of interest or concentration. Learners then complete 12 credit hours of directed reading in this area. Prospective students must have completed a minimum of 21 undergraduate credit hours in history, or the equivalent of a minor. Applicants must also submit a one-page statement of purpose regarding their areas of interest in the field and their academic objectives. Applicants must also submit recent GRE scores. Louisiana Tech holds regional accreditation from the Southern Association of Colleges and Schools. Located on a sprawling, 218-acre campus in Emporia, Kansas, Emporia State University began as a teacher preparation institute. For the last 40 years, ESU has offered accredited undergraduate and graduate degrees in the liberal arts and sciences. Students can earn their degrees on campus in Emporia, at ESU’s satellite campus in Kansas City, and online. ESU offers 65 programs of study, including more than 30 graduate options. Students in ESU’s distance learning programs can access a variety of campus resources, including tutoring, test preparation, library services, and technology support. ESU offers an online master’s in history program for learners with an undergraduate background in the field. The 36-credit hour program offers students three unique tracks: thesis, non-thesis, and social sciences education. The thesis option allows students to complete a thesis project in place of a master’s examination. All tracks require core courses in historiography, as well as core research seminars. The social sciences education track prepares students to teach in their chosen concentration area, but does not lead to licensure. Students may pursue an optional public history certificate on its own, or in conjunction with any of the other track options. Prospective students must have completed a minimum of 12 hours of undergraduate study in history. Students local to the Emporia campus may apply for a graduate assistantship, which offsets tuition costs and provides students with valuable teaching experience on campus, alongside full-time faculty members. ESU holds regional accreditation from the Higher Learning Commission. Founded in 1905 in Springfield, Missouri, Missouri State University serves a student body of over 24,000. Since changing its name from Southwest Missouri State University in 2005, MSU has welcomed tens of thousands of students, both on campus and online. Distance learning programs at MSU boast some of the lowest tuition rates in the state, while still offering students the same quality education as on-campus programs. Online students at MSU also have access to the same valuable resources and support as on campus students, including one-on-one writing and research assistance. The online master’s in history offered at MSU generally takes students about two years to complete. Students can tailor the program’s 30 required credit hours towards a specific concentration of their choice, including U.S. and world history options. Depending on their academic and career goals, students may elect to write a thesis or pursue a non-thesis option. The core curriculum includes courses in historiography and historical methods, as well as a variety of reading seminars in different concentration areas. To apply, candidates must have completed a minimum of 24 undergraduate credit hours in history. Applicants who hold a teaching certificate in social studies may waive the required GRE scores; however, applicants with less than a 3.0 average undergraduate GPA must submit recent GRE scores for admission. MSU holds regional accreditation from the Higher Learning Commission. Ashland University in Ashland, Ohio, offers two options for those seeking an online master's in history: a master of arts with a specialization in teaching American history and government (MASTAHG) and a master of arts in American history and government (MAHG). AU's MASTAHG program utilizes a virtual classroom, administered by Cisco's WebEx, that allows for a fully interactive virtual environment for both professors and students. Students can opt for week-long summer courses or a hybrid of the two, and the degree typically takes 2-3 years to complete for a total of 36 credit hours. Courses cover topics such as the progressive era, the early republic, and the great American texts. Graduates must pass the QE (Qualifying Exam) and a written comprehensive test covering their analytical skills, interpretive skills, and knowledge of historical text/excerpts. The MAHG programs requires 32 credit hours of coursework during the week-long summer hybrid programs in June and July. Students can choose from a traditional master's thesis, capstone project, or comprehensive exam when it comes time for graduation. Prospective students can take advantage of a tuition-free, week-long summer course of their choosing. AU champions affordability by offering numerous fellowships with application guidance and competitive tuition options. All students can utilize and benefit from tutoring services, graduate writing consultations accessible online, small class sizes capped at 16, library services, and online catalogs of academic journals and resources. The Higher Learning Commission accredits Ashland University. The University of Louisiana Monroe offers one of the best online history master's programs with a non-thesis option through Moodle, an interactive learning platform. To apply, prospective students must submit their academic transcripts and a writing sample. They should hold a minimum 3.0 GPA, and those with a GPA between 2.5-3.0 can submit a GRE test score of 283 or above. Bachelor's degree coursework must demonstrate completion of 18 semester hours in social sciences and humanities, with at least nine semester hours of history. ULM provides competitive tuition and financial aid options to in- and out-of-state students. Once admitted into the graduate program, students can look forward to subjects such as colonial Latin America, the Middle Ages, and World War II. Project and assignment submissions go through LiveText. Online students may take advantage of all on-campus resources in addition to ones tailored for interactive scholars, such as academic advising, online library services, ULM mentorship programs with alumni, community events, and counseling services. Students must complete 30 credit hours of coursework in addition to passing an oral and written exam to graduate. The Southern Association of Colleges and Schools Commission on Colleges and the Southern Regional Education Board oversee ULM's accreditation. Southern New Hampshire University offers an online master's in history with three concentrations: American history, military history, and public history. The program requires 33 credit hours that students complete in 15 months. Coursework covers topics such as the Cold War and the American empire, the Russian revolution, and the digitization of history. Graduates engage directly with their professors and fellow classmates through weekly online assignments and discussion boards. Students can look forward to tailored academic advising, online libraries, tutoring and writing services, and a multitude of grant and scholarship options for financial support. The SNHU recruitment department provides graduates with career resources, networking with alumni, employment databases, webinars, and weekly opportunity postings. SNHU does not require GRE or GMAT scores, and students with a bachelor's GPA below 2.75 can still qualify for provisional acceptance. Other standard admissions requirements include a personal statement alongside undergraduate and other academically applicable transcripts. The New England Commission of Higher Education accredits Southern New Hampshire University. Situated in the heart of Florence, Alabama, the University of North Alabama's surroundings provide an invaluable environment for researchers to explore civil rights landmarks, Civil War battlegrounds, and Trail of Tears routes. Even from a distance, online students can benefit from the university's experienced professors, small class sizes, and institutional resources. UNA's online master's in history degree typically takes students 2-3 years to complete on a full-time schedule. The program comprises 15 core classes and 18 electives, totaling 33 credits of coursework. The foundational courses involve historiography and methodology, U.S. history to 1877, and world history since 1815. Graduates can decide between thesis and non-thesis options. Online students can easily access the school's resources from afar, including free Microsoft Office programs, online library catalogs and academic journals, research consultations, tutoring services, writing consultations, and advising services. For those seeking financial aid, UNA's student financial aid center facilitates graduate assistantships, endowed scholarships, work-study programs, and workforce development options. The career center hosts networking events to connect current graduates with alumni for workforce guidance. Online students looking to get involved with the community and engage with fellow classmates can explore the honors societies, recreational facilities, and the History Graduate Student Association, which publishes the North Alabama Historical Review. Applicants to the program must supply official academic transcripts, GRE test scores, a personal statement, writing sample, and three letters of recommendation. The program requires a minimum 2.75 GPA, and transcripts should demonstrate at least 24 credits of undergraduate coursework in history. The Southern Association of Colleges and Schools accredits the University of North Alabama. Pittsburg State University offers an online master's in history degree consisting of 30-32 credit hours covering subjects including world history from 1500; American history from 1865; and Samurai history, literature, and myth. The graduate council oversees an accelerated master's degree that allows transfer students to apply 12 credits towards graduate coursework with approval. Students can choose from three options for degree fulfillment: a thesis option; an applied research option with special advanced project; and an advanced coursework defined by research papers, portfolios, practica, internships, or comprehensive exam. The university offers many valuable resources, including a career services center that assists students with resume guidance, job postings, events, and interviews. The Leonard H. Axe library offers tutoring, and online students can access the library's extensive databases, academic journals, and electronic catalogs. Applicants must submit academic transcripts and a personal essay that dives into their background in history, their purpose for pursuing an online master's in history degree, and their expectations for the program. Pittsburg State University is accredited by the Higher Learning Commission. Established on a former military outpost, Fort Hays State University includes the Sternberg Natural History Museum. This innovative public educational institution offers an online master of arts in history without thesis. The program consists of 30-33 credits hours and stipulates that online students complete three credit hours of advanced historical methods (unless taken as a undergraduate), three credit hours of historiography, six credit hours of seminars that include writing major research papers, and 21 credit hours of electives. These credit hours prepare graduates for a final written comprehensive exam and research paper. To obtain an online master's in history degree from FHSU, applicants must submit official academic transcripts verifying their bachelor's degree, two letters of recommendation, a writing sample, and a personal statement. Graduate admissions for historical researchers requires 18 credit hours of previous history coursework, including methodology of historical research. Applicants must submit GRE test scores if their GPA does not meet the standard 3.0 or higher. If a student's undergraduate GPA sits between 2.5-2.99, they need to meet the GRE test score requirement of a 150 verbal or higher. Once enrolled, online students enjoy all of the same resources as on campus students. FHSU offers career services, online tutoring and writing assistance, and technical support. Online students can run for the virtual student senate and FHSU honor societies. Faculty members utilize Blackboard for uploading course materials; facilitating discussion boards; and posting videos, presentations, labs, exams, and projects. The Higher Learning Commission accredits Fort Hays State University. Prospective historians and researchers exploring online master's in history programs can enjoy the rich history of Memphis made readily available by the University of Memphis and its library. All remotely accessible to global and online students, UM offers an online master of arts program in history. The degree, which requires 33 credit hours of coursework, allows graduates to choose between a thesis track or comprehensive exam. Courses include a study of Renaissance Europe, the Greek experience, and modern Japan from 1800 to the present. With approval, transfer students can apply previously completed coursework from another institution to their degree requirements. The bursar's office awards graduate scholarships and fellowships and assists in financial aid. For admissions, virtual students must specify the intent to study online in their personal statement. Additionally, applicants need to provide official academic transcripts, GRE test scores, two letters of recommendation, and a writing sample. Online graduates may take advantage of UofM's comprehensive advising, career counseling, graduate workshops, and professional development opportunities. Students can gain leadership experience in a variety of ways through graduate student associations. UofM's archives institutional history in its Heritage Room, and the library oversees the Benjamin Lawson Hooks Papers, the National African American Photo Archive, internet archives, and a digital repository that cares for the preservation of Memphis history. University of Memphis is accredited by the Southern Association of Colleges and Schools. Jackson State University's master of arts in history online consists of 36 credit hours and covers topics such as global history, African diaspora, U.S. history, and public history. Courses include introduction to museology, history of women in America, and colonial Africa -- with students choosing between a thesis or project to graduate. Transfer students may apply up to nine credits hours from another accredited institution toward their JSU master's requirements. Learners should expect to take a Graduate English Competency Exam, and, based on thesis or non-thesis pursuit, six credit hours on understanding historical research, criticism, and historiography. Online students engage with professors and classmates through discussion boards and presentations in Canvas. Whether in-person or virtually, students can utilize all of the university's resources. The Richard Wright Center tutors in writing, rhetoric, and research. The Degree Works system administers academic advising and accountability for scholars. The Margaret Walker Center commits to conserving and fostering African-American history and culture through its museum and archival facilities. JSU admissions requires a GPA of 3.0 or higher, official academic transcripts, three letters of recommendation, a statement of purpose, and a writing sample. The Commission on Colleges of the Southern Association of Colleges and Schools accredits JSU. Based in Downtown Terre Haute, Indiana State University grants an online master of science in history degree. The program demands 33 credit hours of coursework, including 12 core classes, three directed classes, and 18 electives facilitated through Blackboard. The concentrations available include U.S. history, European history, and the history of the wider world. This particular program does not require a thesis submission, and students can complete the degree part-time in 2-3 years. The hybrid option only takes two years to complete. Courses cover topics such as the Gilded Age and progressive era from 1877-1917, women in history, and seminars on popular movements. Prospective applicants need a bachelor's degree in history or comparable coursework with a GPA of 2.7 or higher for undergraduates and 3.0 or higher for graduates. ISU does not require applicants to submit GRE scores; however, the university allows students to submit scores if they feel they will help admissions. Students enjoy resources including the library, financial aid, career center, and student services. The Cunningham Memorial Library supplies a libguide for distance students and protects historical documents detailing the American labor movement. The Sycamore Express facilitates financial aid with scholarships, grants, and federal work-study programs. ISU's career center provides resume consultations, internship opportunities, employment assistance, and mock interview simulation. The Higher Learning Commission accredits ISU. Wayland Baptist University's online master of arts in history degree helps distance students earn a well-respected degree from the comfort of their homes. This online master's in history requires 37 hours of course credits, with 13 core classes and 24 electives. Students choose between thesis and non-thesis options, and course offerings include ethics and gender history, environmental history, and a history of warfare. WBU's online format supports the institution's dedication to environmental sustainability and conservation efforts aimed at minimizing waste. The virtual classroom facilitated by Blackboard easily connects students with their professors and fellow classmates. After class, students can further engage through the university's honor societies and historical associations. They can also utilize the health, career, tutoring, and counseling services. Students can access the university library completely online and take advantage of free shipping for book transfers and a multidisciplinary writing center with workshops. WBU offers different admission options based on a student's educational resume, and the university's #BeTheSolution campaign strives to empower students' personal development through lecture convocations and community service events. The Southern Association of Colleges and Schools Commission on Colleges accredits WBU. Centrally located in southern Alabama, Troy University administers a unique online master of science in history education (6-12) available 100% online during nine-week terms. Comprised of 36 credit hours, this master's in history program includes 18 core courses and 18 teaching field courses. Prospective students can tour TU's online program through a simulated Canvas course. Online students take classes in research methods, educational evaluation, and classroom management techniques; graduates with previously completed coursework may transfer credits towards their master's degree. Degree completion relies upon a written comprehensive exam, portfolio, thesis, field project, or standardized exam. The school tailors academic advising to the needs of each student. Virtual students exploring an online master of science in history must receive admission into the TU graduate teacher education program. Admission requires an essay on the student's teaching philosophy, official baccalaureate transcripts, and a GPA of 2.75 or higher for all postsecondary education with no conditional acceptances. Distance students can benefit from the university's exceptional student services and institutional partnerships, and all graduates can access the university's counseling team, writing centers, online tutors, and financial aid advisers. The university partners with the Alabama World Affairs Office, the Center for Environmental Research, the Center for International Business and Economic Development and Alabama's ACCESS (Alabama Connecting Classrooms, Educators, and Students Statewide). Union Institute and University offers an online master of arts in history and culture focused on real-world application. Though the school maintains its flagship campus in Cincinnati, Ohio, Union campuses can also reside in Florida and California. This online master's in history program requires 36 credit hours, with options for part- and full-time learning -- the latter allowing for graduation in as few as 16 months. Transfer students may apply up to six credits with approval. Twelve core credits cover disciplinary foundations, elements of scholarship, and research methods. These are followed by 15 advanced credits canvassing fields of study, applications, and advanced research methods. The graduation capstone entails a thesis worth nine credit hours. Course subjects include women's studies, art history, and peace and justice studies. Applicants must possess a bachelor's degree with a GPA of 3.0 or above and submit three letters of recommendation, a resume, and a statement of purpose. The admissions council reviews all graduate applications. Union provides a number of financial resources, including scholarships, graduate fellowships, external scholarships, grants, and work-study programs. Post-graduation, students can continue to benefit from customized alumni career services. Current students maximize their educational investment by making the most of the university's tutoring programs, math and writing centers, professional partnerships, and academic advising. Online students do not need to worry about gaining access to research. The Union library furnishes electronically available databases, journals, dissertations, and scholarly articles. Union is accredited through the Higher Learning Commission. Western Kentucky University's rich historical heritage fosters cultural development in the city of Bowling Green by directing The Kentucky Museum and offering a nationally competitive online master of arts in history degree. The non-thesis program generally takes students 2-3 years to complete and requires 36 credits of coursework. Coursework includes three credits of core classes, 12 credits of concentration courses, and 21 elective credits. Online students can choose from classes such as historiography, the non-Western world, and post-Civil War United States. Transfer students with approval may apply up to 12 hours of credits to the fulfillment of WKU's online master's in history degree. Distance students get a firsthand experience of the WKU ethos through an online graduate orientation and virtual campus tour. Professors engage with students and provide course materials, lecturers, schedules, and assignments through Blackboard. Admission into the online master of arts in history program requires official academic transcripts, a bachelor's degree with at least 18 credits of undergraduate coursework in history, a GPA of 3.0 or higher, GRE scores, a sample research paper, and a personal statement. The university prides itself on offering a vast array of resources and services for its online students. Virtual students can take advantage of the library from the comfort of their homes thanks to web-based access. The university's institutional research center partners with the Center for Research and Development and the Applied Research and Technology Program. Financial service advisers assist students with funding through scholarships, grants, work-study programs, endowments, and loans. The Center for Career and Professional Services hosts events, posts webinars, tracks individualized career goals, provides on-demand career advice, and maintains a forum for graduate discussions. The Southern Association of Colleges and Schools accredits Western Kentucky University. Program details vary between schools, but the best history graduate programs offer concentrations and course options that enable you to explore your historical area(s) of interest. Below, you'll find an overview of specialization options and courses you can expect to see. American History This concentration allows you to examine topics in American history and their influence on modern society. Students analyze and evaluate historical events across American history, with courses including early American encounters and the Cold War. Students in this concentration pursue careers in research, writing, and teaching. Military History This concentration focuses on the political, cultural, and economic effects of war, and students examine the major global wars and military theory. Examples of course topics include the Russian revolutions, Chinese imperialism, and the era of the Civil War. The Department of Homeland Security, the U.S. Department of Defense, museums, and schools often employ military historians. Public History An emphasis in public history provides students with an understanding of the preservation process and interpretation of historical records. Students learn how to edit documentaries and manage archives and museum collections. Career opportunities include work in museums, archives, preservation programs, and governmental research. History and Historiography: This course examines the study of history itself, introducing students to fundamental methodology for interpreting the past. Common topics include the development of history as a discipline, information literacy, historical research methods (including primary and secondary sources), and the inherent challenges in historical interpretation. Research and Methods: A common core requirement, this course offers an in-depth perspective on methods of historical research, examining the strategies that historians use to gather, analyze, and evaluate sources. Most courses focus heavily on writing, typically requiring students to complete multiple history research papers. Historical Lenses: This course examines perspectives historians use to interpret history, including race, class, gender, and economics. Students use these points of view to shape their research and the questions they pose about historical events and periods. Public History: The practice of presenting historical information to a popular audience, public history presents nontraditional sources that engage the public. This course explores the processes through which the past is interpreted, institutionalized, and framed for audiences. United States History: U.S. history courses explore major perspectives on the country's development, often with a focus on major periods, such as the Civil War era, Reconstruction, or the Cold War. How Long Does It Take to Get an Online Master's in History? Many factors affect the length of a master's in history degree, including course load, enrollment options, and program format. However, you can generally expect to take 30-37 credits over 2-3 years to complete your degree online. Students can complete some accelerated degrees in as little as one year, though these programs typically require learners to enroll full time and take courses year-round. Other programs offer part-time enrollment, which results in fewer courses per semester but a longer total degree completion time. These longer, part-time programs may work well if you don't want to put your current career on hold. Finally, some online degrees use a cohort format that requires you to complete a set sequence of courses alongside your classmates, while others offer a self-paced model that enables you to work at your own speed. Archivist Certification: Offered by the Academy of Certified Archivists (ACA), this certification requires applicants to pass the archivist certification exam (100 multiple-choice questions), ensuring they hold the expertise necessary to preserve and maintain historical documents. ACA features an online forum where students can form study groups. Students must earn their master's degree prior to taking the exam. Small Museum Certification: The American Association for State and Local History offers a certificate training program for historians who work, or who want to work, in small museums. To become certified, professionals must complete five online courses. Topics include developing exhibits, museum education, and outreach. When researching your MA in history degree, always ensure that your potential schools hold proper accreditation. Accreditation, or the process through which colleges regulate themselves and maintain institutional quality, comes in two forms: national and regional. Technical and vocational colleges typically hold national accreditation and offer career-focused programs like welding or medical assisting. Colleges focused on traditional academics, such as history and science, typically hold regional accreditation. Virtually all outstanding history graduate programs boast regional accreditation. While no agency accredits history programs in particular, you should always look for schoolwide accreditation from one of seven regional accreditation agencies, including the Accrediting Commission for Community and Junior Colleges, the Higher Learning Commission, the Middle States Commission on Higher Education, the New England Association of Schools and Colleges, the Northwest Commission on Colleges and Universities, the Southern Association of Colleges and Schools, or the Western Association of Schools and Colleges. The U. S. Department of Education (ED) plays a role in regulating higher education, overseeing the agencies that provide accreditation for colleges and universities. The Council for Higher Education Accreditation (CHEA) also ensures that accreditation agencies maintain standards and assess schools properly. Together, both organizations regulate higher education accrediting agencies, which assess each school's curricula and administrative practices. If you have trouble finding a school's accreditation status on its website, or if you need to determine that an accreditation agency itself is reputable, you can check the CHEA or ED websites, which contain listings for accreditation agencies and accredited schools. Education, work experience, industry, and location affect salary levels for historians. The chart below compiles average salary data for historians in different U.S. states. The District of Columbia boasts the highest average mean salary for historians, likely due to the variety of museums, historical societies, and government organizations located there. States from the East Coast, West Coast, Southwest, and Mountain states round out the list, demonstrating the career potential for historians around the country. As always, make sure to consider the relative cost of living when examining career salary data for a state. The best history graduate programs prepare you for a variety of career paths, and the skills gained in these programs commonly apply to many different jobs. In general, history careers require strong writing, research, critical thinking, and communication skills, as the field commonly involves gathering and presenting information to both specialized and popular audiences. Below, you'll find an overview of five of the most common careers for history graduates, along with salary information for each. Historian: Historians research, gather, analyze, and interpret data from a wide assortment of historical sources, such as public records, books, and artifacts. Typically specializing in a particular field or era, they may work in museums, colleges, historic sites, nonprofits, and even businesses. Archivist, Curator, or Museum Worker: Preserving historical documents and other artifacts, archivists and curators often work for museums, historical societies, libraries, and any other environment that stores historical information. These specialized historians oversee collections and may take responsibility for authenticating, cataloging, preserving, restoring, and presenting historical objects. History Teacher: Typically working in public or private high schools, history teachers introduce students to fundamental concepts of history, often focused on specific geographical areas, such as world or U.S. history. Writer: Writers create written content for all types of media, including books, magazines, TV shows, and websites. Historians may find success writing about history for popular audiences, or they may apply their skills to other subjects. Most writers are self-employed, but others work in media organizations and other professional environments. Editor: Working alongside writers either in an office or from home, editors review and revise written content for professional publications. History majors can apply their skills of critical thinking, written communication, and research to successful careers as editors. Current students and recent graduates benefit from joining professional organizations. The organizations listed below provide students with networking opportunities, including professional mentoring, internship and career opportunities, and research grants. Annual conferences provide further opportunities for professional connections, and students gain access to the latest research topics in the field, such as forms of history, using history to build communities, and campus histories. American Historical Association: Devoted to the advancement of historical study, the AHA serves as the largest historian organization. Graduate students benefit from the association's career diversity initiative, which strives to broaden opportunities for recent graduates. Organization of American Historians: The OAH offers several benefits to its members, including insurance programs that cover professional liability, automobile, medical, and more. OAH members have access to the organization's scholarly journal, a quarterly magazine, and teaching tools. National Council on Public History: As a student member of NCPH, you may access the council's publications, workshops, and career support. NCPH boasts several advocacy interests, and students can partner with organizations to promote history education. Earning your master's degree in history online does not have to cost a fortune. Students can consider using federal grants and loans to fund their degrees. To receive government help to pay for your education, you must complete the Free Application for Federal Student Aid, known as the FAFSA. Students can also participate in a work-study program or graduate assistantship. Many graduate assistantships waive tuition fees and provide students with a monthly stipend. Other opportunities are available in the form of private scholarships and grants specifically for history majors. Approximately two-thirds of today's college students rely on loans to fund their education, but plenty of overlooked financing options exist to reduce your overall student debt. Completing the FAFSA represents a crucial first step for any student with financial needs. Our FAFSA guide features a step-by-step rundown of the process and answers several FAQs. Online programs can provide an affordable and flexible option for women trying to balance the demands of work, family, and schooling. We've curated a list of valuable scholarships specifically for women. Online college programs represent a flexible, affordable option for single parents interested in earning a degree and securing their family's financial future. We've compiled a list of scholarships, grants, and other financial aid options geared toward single moms and dads. Millions of dollars of funding are reserved for U.S. military personnel, but much goes unused. Learn more about grants, scholarships, and other financial aid opportunities available to veterans, active-duty service members, and reservists. Students who pursue online degrees sometimes qualify for scholarships, grants, and other financial aid unavailable to their brick-and-mortar counterparts. Learn more about these financial opportunities for web-based learners.